The Canvas Lunch Bag is practical for transporting food. You can fill it up with fancy foods, natural living products, spa and beauty products…whatever! This lunch bag has a VELCRO® like closure and rope for easy carrying. All seams are double stitched for durability. Invite the kids to create their own bags with colorfast fabric markers. 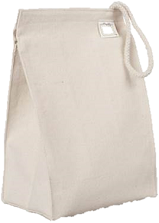 The Canvas Lunch Bag is practical for transporting food. You can fill it up with fancy foods, natural living products, spa and beauty products… whatever! This lunch bag has a VELCRO® like closure and rope for easy carrying. All seams are double stitched for durability. Invite the kids to create their own bags with colorfast fabric markers. Capacity: Can hold a full lunch.